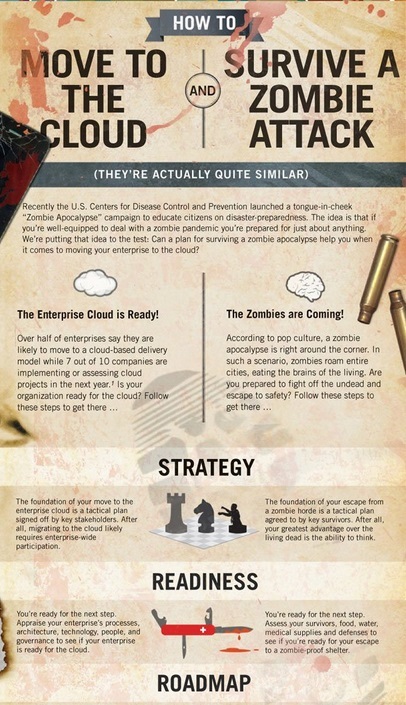 The concept of a zombie apocalypse neatly fit into SunGard's key business of disaster recovery, and the marketing team was even able to time the campaign with a summer motion picture release. The overall effort involved multiple marketing channels, and was tied to both the continuing popularity of zombies in popular culture through television shows like "The Walking Dead" and was timed to coincide with a summer 2013 zombie-related motion picture "World War Z." 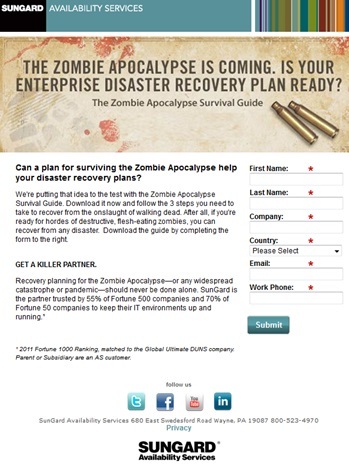 Kicking off with an email campaign, the firm offered recipients a digital manual about surviving the zombie apocalypse that was focused on SunGard's business continuity disaster recovery services. Another asset was based on migrating to the cloud and how that business option aligns with surviving the zombie apocalypse. 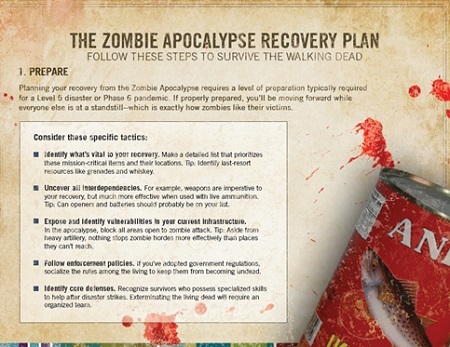 Each asset was clearly tied to the campaign theme of surviving a zombie apocalypse, and at the same time, highlighted different areas of SunGard's products and services. A second, retargeting effort rounded-up people who hadn't responded to email for six months or longer. This aspect of the email campaign tied into the theme with messaging including, "We haven't heard from you in a while. Are you among the walking dead?" For both components of the email campaign, the overarching goal was getting prospects into the pipeline — or back into the pipeline for the retargeting effort — rather than moving people down the pipeline. The call-to-action was to get the email recipients to a landing page where registrants would enter to win a physical "zombie survival kit." This multichannel marketing effort was relatively simple: emails driving recipients to a landing page, and two key pieces in the direct mail sends. All of the campaign components served to provide the core messaging about SunGard's products and services. •	The "IT Availability Cloud" email campaign achieved 1.2% higher click-to-open (CTO) among director level, and above average rates in global, large and medium enterprises. •	The "Disaster Recovery/Managed Recovery Program" campaign created a 3% increase in CTO among president or owner titles. •	The retargeting email reactivated 2% of contacts who had not interacted with SunGard within the previous six months.